While the first few Picross e games mixed things up a little with slightly different modes each time, the previous game in the series — Picross e4 — didn't do anything unique; it simply brought back all of those previous special modes. Picross e5 also plays it safe and is essentially an expansion of the previous game, with exactly the same modes on offer. Naturally, the standard form of Picross is still here — you use the numbers displayed next to a grid in order to chisel away the right squares and, eventually, form a pixelated image. 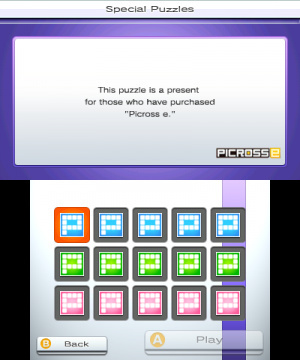 The first three games in the series offered a separate set of "Free" puzzles, where the game did not provide you with any hints on if you were doing things right or wrong, but just like in the previous title this does not come with its own separate set of puzzles this time around; instead you can simply opt to play any of the "normal" Picross puzzles with regular or free rules. Also on offer are several Micross and Mega Picross puzzles, both returning once again. In Micross, you attempt to complete gigantic puzzles that consist of several smaller squares, essentially revealing one part of the big picture every time you solve a puzzle. There's only three of these to play here, but each of them can take quite a while compared to the other puzzle types. In Mega Picross things get shaken up a bit, as not only are you tasked with solving puzzles with the usual numbers, you'll also get special numbers that cover two lines or columns simultaneously. These are quite tricky to figure out because you'll have to keep a lot more space in mind, and while it could just be one solid block of squares, it could also snake around in an odd pattern. As a bonus for the "repeat visitors", if you happen to own any of the first three games as well you'll receive five bonus Mega Picross puzzles for each one. 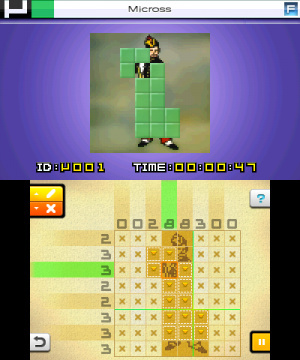 Oddly enough, there don't appear to be any bonus puzzles for owning Picross e4. As usual, the game does offer a decent amount of help for newcomers to the series; you can get fairly detailed text tutorials for each of the different game modes, and you can choose to have the game automatically fill in one row and one column in most of the puzzles for a little a head start. 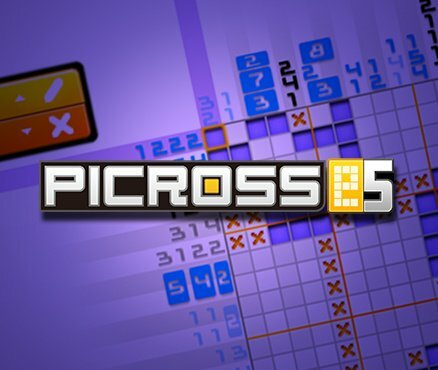 There's really not much to say about Picross at this point — Picross e5 does absolutely nothing different from the previous game and can basically be seen as a new pack of puzzles. Naturally, this isn't a bad thing whatsoever, as more Picross is always welcome. 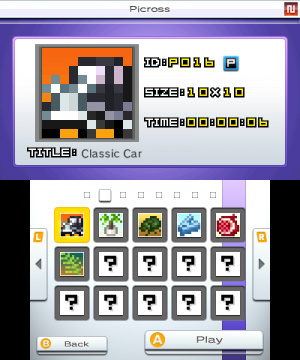 If you enjoyed any previous Picross outings and are craving more, you can't go wrong by grabbing this as well. I'll get this. Having every Picross looks good in my Picross Folder. I've already completed it, being the Picross junkie that I am. It's basically Picross e4 with new puzzles. Nothing more, nothing less. I just snooped around the Jupiter website and noticed a game titled Club Nintendo Picross Plus (the icon features a pixelated Yoshi). Apparently, it contains Super Mario, The Legend of Zelda and Animal Crossing themed puzzles. I hope they'll release it outside of Japan. I'm assuming that it's a Club Nintendo reward, but I'd be happy to pay for it (if given the option). I buy the next part of the series when I complete the whole previous version, I find this game very relaxing I am currently busy with the 3rd installment. There is one new feature worth mentioning. this one has 15x20 puzzels. The others have had upto 15x15. But this play it safe on the eShop is an ongoing issue. While games like Tetris or Dr.Mario make sense to have on the eShop due to its simple game play and mechanics no longer warrant full releases there are some franchises that could be pushed farther. For example, Planet Puzzle League had a full release with the ds and now we have an express version on the 3ds with less features meanwhile Pokemon Puzzle league on the N64 had a 3d version that would look awesome on the 3ds and the 3ds is capable of running N64 games. Likewise Picross had a 3d version on the ds where you chiseled block off a model and while most of that game play took place on the touch screen (Which would make 3d visuals on the 3ds a bit of a mute point) it was a new way to play the series. Sure the eShop has saw some improvement for some franchises like in the Mario vs. Donkey Kong series but I can see some franchises only getting watered down version from here on out. If this is what an eShop price point does to a franchise then I am saddened by the loss of retail version what actually tried to push boundaries. I'll probably download it these days in the hope that i get farther than in e3 and e4. For some reason i've started to have problems in these where i could easily complete every other Picross game i got before. Amen to that, @Rob_mc_1 ! I always forget about these games, which is odd because I love Picross and haven't played a new one in quite a while.